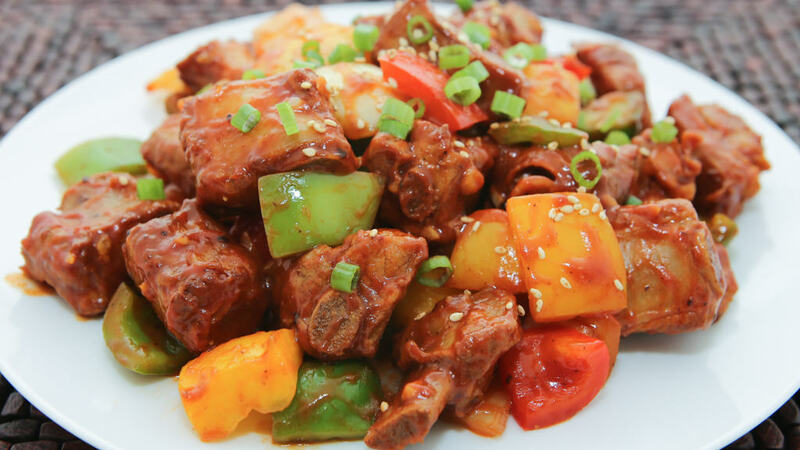 This dish of pork spare ribs cooked with a zesty sweet and sour sauce, bell peppers and sweet onions is a wonderfully comforting and satisfying. It’s easy to make and you can serve this delicious stir-fry over rice for a simple meal or pair with a hearty soup for a truly belly-warming Vietnamese meal. Enjoy! 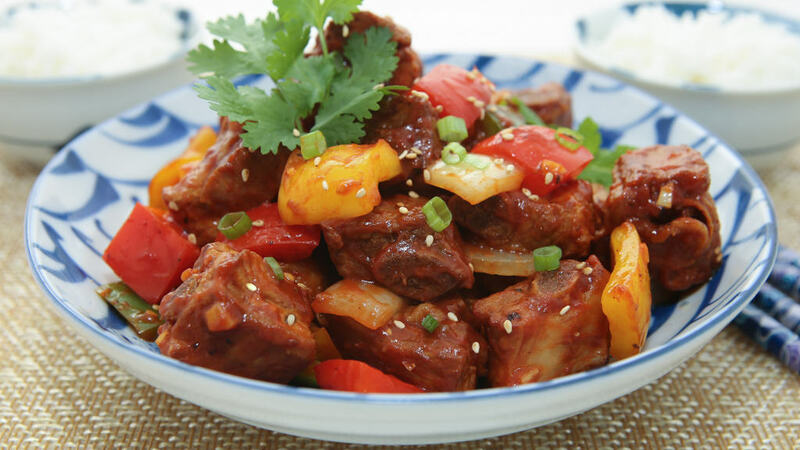 The best type of ribs for this recipe is the pork rib tips–meaty sections attached to the lower end of the spare ribs. These ribs are more cartilage than bone and the meat is nice and tender. If you can only get the spare ribs, these are fine too. Purchase ribs that are cross cut or ask your butcher to cut for you. If all you can find is a rack of ribs, just chop them into smaller sections using a meat cleaver. I am pretty thorough about preparing the ribs and wash them with salt and then parboil to remove the blood and marrow. These steps help to reduce the smell that is common with pork bones. If you don’t mind the porky “aroma” or looking to save some time, you can skip these steps. If you would like more of a sauce for dipping or drizzling over rice, skip the corn starch and add 1/2 cup water to the sweet and sour sauce. If you enjoyed this recipe, you may also like: Asian-Style Beef Short Ribs (Suon Nuong) and Beef Shank and Pickled Mustard Greens Soup (Canh Dua Cai Chua Bap Bo). Place the ribs into a large bowl and sprinkle with 2 tsp salt. Rub the salt onto the meat. Rinse the ribs with cool water washing off the salt. Trim off any visible fat and then cut the ribs into 2-inch sections. Place the meat into a large pot along with 1 tsp salt. Fill the pot with water covering the ribs completely. Cover the pot and bring the water to a boil over High Heat. Reduce the heat to Low. Skim off the foam and discard. Cook on Low for 5 minutes. Transfer the ribs into a colander and rinse with cool water. Return the ribs to a clean pot. Add the thick soy sauce and mix well. Add the coconut water and just enough water to cover the ribs. Cover the pot and bring to a boil over High Heat. Reduce the heat to Low and simmer for 20 minutes or until the meat is tender. Mince the garlic. Cut the bell peppers and onions into chunks. In a measuring cup, combine the pineapple orange juice, rice vinegar, sugar, and corn starch. Heat a large wok over Medium High heat and add 1 tsp vegetable oil. Add half of the minced garlic and stir-fry for 10 seconds. Add the vegetables and stir-fry for 3-4 minutes or until they just start to soften. Transfer to a bowl and set aside for now. Adjust the heat to Medium. Add 1 tsp vegetable oil, the remaining minced garlic and the tomato paste. Stir-fry for 15 seconds. Stir the juice mixture and pour into the wok. Mix together. Add the ribs and toss with the sauce, cooking for 2 minutes. Add the vegetables and fish sauce and stir-fry for another 2 minutes. Top with freshly ground black pepper. Garnish with chopped green onions and toasted sesame seeds. Serve while hot!